February was a great month for Muscle Trading as we were able to build on our strong month of January with some amazing gains. Our biggest overnight gainer was YRIV - alerted for +37% max profits from the $0.46 alert on the 22nd and hit a high of $0.63 on the 2-day swing call (Feb. 25th). Bought YRIV with 4 minutes left before market close February 22nd at $0.465 and sold it two days later (25th) 40 minutes after open at $0.585. It was alerted to MT members on February 22 at $0.46. The high of the day on February 25th was 0.63 for +37% profit potential on this alert. February saw only 8 losing picks with a +210.75% maximum profit potential after stop-outs (-22%). While YRIV was our biggest overnight gainer at +37%, we also saw big runners with TGTX from the 8th – 8%, ATEC from the 11th (18%), HAIR from the 14th (7.5%), BTX from the 15th (12%) USAT from the 19th (11%), SOLO from the 25th (27%), and CLD from the 27th (9.5%). 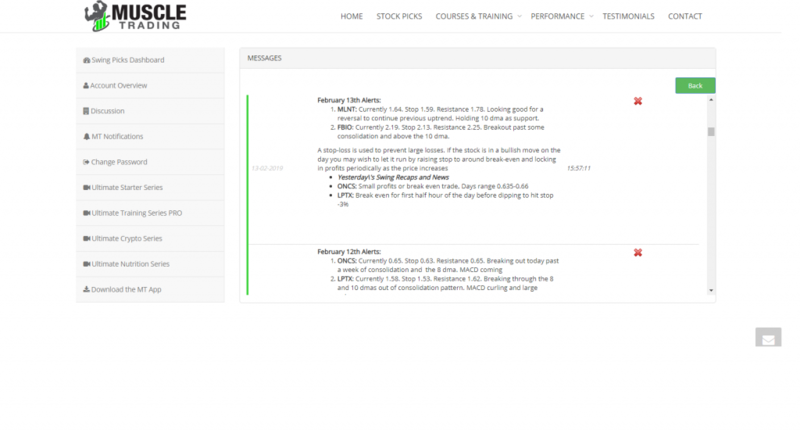 All trades are updated to our members dashboard daily in addition to being sent directly through email, text, and app.